A public hearing for Boston Properties’ Reston Gateway project, which is designed to bridge the future Reston Town Center Metro Station with the community’s urban core is set for June 27 before the Fairfax County Planning Commission. Boston Properties has proposed to include up to 3.5 million square feet of transit-oriented development on 33 acres immediately north of the future RTC Metro Station. The Reston Planning & Zoning Committee will receive a presentation on the proposal at 7:30 p.m. today in the North County Government Center (1801 Cameron Glen Drive). Fannie Mae will lease roughly 850,000 square feet of the property. 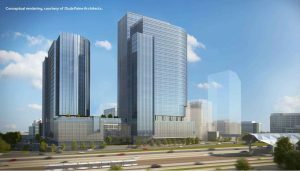 At full buildout, Reston Gateway may include up to 1,700 residential units, 570 hotel rooms, 200,000 square feet of retail and nearly 2 million square feet of office space.